Nearly half of the polling stations, where Keshdhari Sikhs will cast their vote for the Shiromani Gurdwara Parbandhak Committee (SGPC) elections tomorrow, have been classified as sensitive. Yet no Central forces will be deployed in the state for the poll. Pardeep Singh Walia, Panthic Morcha candidate for the SGPC elections from Amritsar West, accused some SAD men of abducting his son Simrandeep and assaulting his supporters this morning near Kotwali. After about two hours, the abductors left Simrandeep at police station B-division. Booth capturing during the SGPC poll slated to be held tomorrow is what the Gurdaspur police is fearing in this district where two Akali stalwarts, one of them eyeing the presidency of the Sikhs mini parliament, are testing the waters. Folk singers, comedians and ballad singers are an inseparable part of political rallies in Punjab. While politicians utter mumbo-jumbo, it is the folk and ballad singers who catch the voters’ fancy and regale the crowd with their lively singing and sparkling one-liners. Hailed as “mini parliament” of the Sikhs, the Shiromani Gurdwara Parbandhak Committee (SGPC) has underwent several political upheavals while continuing as a powerful instrument in Punjab politics in general and the Sikh politics in particular. Though mandated to be a religious body to manage affairs of Sikh historic shrines, it has been, since its inception in 1926, the epicentre of heightened political activity every time it goes to its electoral college, at times controversial. Initially, it was every three years and now it is five years, but the elections to the general house are being held after seven years this time. Ridiculing Chief Minister Parkash Singh Badal’s unsolicited presence at the fast of Gujarat Chief Minister Narendra Modi, Punjab Pradesh Congress Committee President Capt Amarinder Singh today said he “was showing double standards”. The Dhusi bundh on the Satluj at Baopur village in Shahkot has been eroding fast since afternoon today raising fears of a breach. 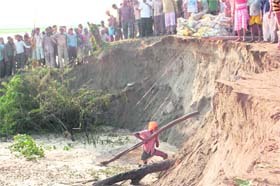 Apprehending a flood, a few villagers have started moving to safer places. Nearly 18 months after his claim for promotion was rejected, the Central Administrative Tribunal has directed the Union of India and the State of Punjab to consider IAS officer CS Srivastava’s case for elevation to the rank of Principal Secretary or Commissioner. Shindo Sahni, District Education Officer (Secondary), in Education Minister Sewa Singh Sekhwan’s home district of Gurdaspur, has been found guilty of ordering school managements to purchase furniture on terms dictated by her and even handing over money to the selected firms in advance. Some of the schools are yet to receive the furniture. The Health Department is facing difficulty in controlling the outbreak of the vector-borne diseases in the rural areas due to shortage of multipurpose male health workers. These workers are supposed to go out in the field and conduct surveys regarding various national health programmes, including vector-borne diseases programme. Due to staff shortage, the department has to depute other health officials. Reacting sharply to the news that appeared in the columns of The Tribune today “Rural doctors demand quota in PG courses”, the Punjab Civil Medical Services (PCMS) Association announced that they would oppose any reduction in the number of reserved seats for the PCMS doctors in the PG (MD/MS) courses in the state medical colleges. Studying in Cambridge University might be a distant dream of many youngsters these days but city girl Amandeep Kaur has been selected by the Cambridge University, England, for doing her PhD at the university. Even after she was selected, she never actually thought of going to England because of the huge amount that would be required for her study until the SGPC came forward to sponsor her studies. In what may be termed as an effort to restore its lost credibility on account of the alleged “wrong-doings” in the selection of 312 PCMS doctors, the Punjab Public Service Commission (PPSC) functionaries have made special arrangements to ensure that the process for conducting the main exam of the Punjab State Civil Services Combined Competitive Examination-2009 is transparent. The court of Sessions Judge SP Bangarh today adjourned the hearing in the alleged multicrore city centre scam case, involving Punjab Pradesh Congress Committee President Captain Amarinder Singh till October 20. The court has fixed October 20, 21, 22,28, 29 for hearing arguments against framing charges. Despite ban on sale of liquor in the wake of the SGPC poll, the Patiala police has booked six persons for selling liquor in three separate cases. As per District Magistrate’s orders, the sale and carrying of liquor is prohibited till September 18. Nearly half of the polling stations, where Keshdhari Sikhs will cast their vote for the Shiromani Gurdwara Parbandhak Committee (SGPC) elections tomorrow, have been classified as sensitive. Yet no Central forces will be deployed in the state for the poll. 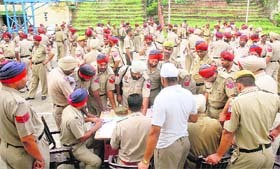 The Punjab Government has given an assurance to the Gurdwara Election Commission that the Punjab Police is up to the task. Two Deputy Commissioners of Amritsar and Fatehgarh Sahib asked the Chief Commissioner, Gurdwara Election Commission, Justice (retd) HS Brar for deployment of Central forces but the Principal Secretary, Home, told the commission that this was “not required”. Justice Brar said the commission had identified 3,762 (45 per cent) of the 8,334 polling booths in Punjab as sensitive and another 490 hypersensitive. In Haryana, of the 533 polling stations, 143 had been declared sensitive and 76 hypersensitive. In Himachal Pradesh, 30 of the 126 polling stations were sensitive and the Union Territory of Chandigarh had all its 28 stations declared as sensitive. Justice Brar said that adequate checks had been put in place to ensure that no bogus votes were polled. “We have asked the polling agents to check the voter ID-card and ensure that only genuine candidates are allowed inside the polling stations. Videography of voter queued outside sensitive booths will be allowed”, he said. The Chief Commissioner clarified that no action could be initiated on the reported cases of bogus voters in the voting lists at this juncture as no one had lodged any objection when asked to do so. He said that it would almost be impossible for anyone who is not a Keshdhari to vote. “Besides, all parties and candidates will have their agents in the polling stations who can identify mischievous elements. The voters have given an affidavit before registering themselves as voters. If any information is found incorrect, they will be liable to be prosecuted under the Indian Penal Code.” Since there are several polling booths within one constituency, votes form different booth would be brought together at one place. “Counting will be done almost simultaneously and the results known after the polling is over. But these would be formally announced on September 22”, he said. Justice Brar said that candidates could take an official copy of the results from the returning officer the same evening. To a question as to why a gap of four days between the counting of votes and the declaration of results, he said the time was kept to cater in case re-polling was required to be held at any booth or polling station. The Gurdwara Election Commission has ordered the closure of all liquor vends in the four states till the time polling comes to an end. It has given specific instructions about the conduct of the poll and the procedure to be adopted. “I have sent a detailed list of dos and don’ts to all the officials involved in the election process through the various commissioners”, Justice Brar added. In a complaint submitted with the Kotwali police station, he has named certain SGPC contenders belonging to the SAD, which included Bawa Singh Ghumanpura and Bibi Kiranjot Kaur. Denying allegations, Kiranjot Kaur said that she had no conflict of interest because she had been contesting from a constituency that was reserved for women candidates. Bawa Singh said he had no inkling about any such incident. “I came to know of it only when mediapersons asked me about my take on the issue,” he said. Simrandeep said that he, along with his supporters, had gone to Kotwali at about 5.30 am to insert advertisement leaflets supporting his father in newspapers when some SAD men, whom he knew, physically assaulted them. “They pushed me into their car and drove around the city. At about 7 am, they dropped me at police station B-division,” he said. In a significant development, the police has earmarked as sensitive all the 107 polling booths in the Dhariwal seat where Agriculture Minister Sucha Singh Langah is fighting the Panthic Morcha candidate Harbans Singh Sidhwan and an independent Nishan Singh. The police have declared these booths as sensitive based on CID reports. Sources disclosed that even as Langah will be having a walk in the park, the police is worried that it may have egg over its face even if a single untoward incident happens. “That is the reason why the edgy police force has decided to mark every single booth a sensitive one,” remarked a candidate. Langah is considering these polls as a dress rehearsal for the all important forthcoming assembly elections. Nearly 80 villages of Dhariwal SGPC seat fall in the newly carved out Dera Baba Nanak assembly segment. “ This is one reason why these elections have assumed importance for the Agriculture Minister. Earlier, he used to contest from Dhariwal but after the delimitation exercise the Dhariwal Vidhan Sabha seat has been de-notified and in its place Dera Baba Nanak seat has been formed. We do not apprehend any violence but we have to be prepared,” remarked a senior police officer on duty in Dhariwal. The Gurdaspur SSP Varinder Pal Singh disclosed that the CID officials have taken into cognisance the old record of Dhariwal seat. It is pertinent to mention here that former Minister and firebrand congressman Sucha Singh Chottepur used to fight SGPC elections from Dhariwal and the seat is best known for sparking off violent incidents both in the SGPC and assembly elections. In nearby Gurdaspur seat where Education Minister Sewa Singh Sekhwan is locked in a stiff battle against the Partap Bajwa backed Panthic Morcha candidate Jagir Singh, the Police have declared 4 polling booths as sensitive. “ In Gurdaspur we expect polling to be held peacefully but we have made deployed additional forces in four booths just to ensure that there is no untoward incident,” said Varinder Pal Singh. Sekhwan’s campaign is being spearheaded by his son Jagrup Sekhwan who, over the last few weeks, has managed to convince young voters to exercise their franchise in favour of his father. With two senior SAD leaders trying their hands at the election the focus has been on personalities rather than on any issues. Folk singers, comedians and ballad singers are an inseparable part of political rallies in Punjab. While politicians utter mumbo-jumbo, it is the folk and ballad singers who catch the voters’ fancy and regale the crowd with their lively singing and sparkling one-liners. And there are comedians who lampoon politicians with their wit and satire. Stand-up comic Bhagwant Mann, who, so far, was parodying politicians in his VCDs and audio cassettes, has now entered politics fully after joining Manpreet Badal’s People’s Party of Punjab (PPP). Bhagwant is canvassing hard for Roop Singh, an Independent candidate in the SGPC elections from the Doda seat in Gidderbaha area. As the Doda seat forms part of the Gidderbaha assembly constituency, the SGPC election there has high stakes with the contest being focused around SAD candidate Navtej Singh Kauni and Roop Singh, the PPP supported, but Independent candidate. In Doda, Bhagwant, in order to fetch votes for Roop Singh, has been concentrating more on the politico-religious issue - how the SGPC under SAD’s command is misusing gurdwara funds. I’m loved for my satirical presentations on the current scenario - whether is it corruption in the police, politics, high-pollution level in the state or the teachers not performing their duties. But my campaign in the SGPC elections is to highlight the misuse of religious powers and gurdwara funds, said Bhagwant Mann. Directly or indirectly, I was never aloof from politics in the 18 years of my career and kept making parodies, hoping that these satirical comments would bring some difference to society’s way of electing a politician, he said. “Now, I have joined the PPP to serve Punjab. I will definitely stand for elections whenever and where ever the PPP needs me for the betterment of Punjab,” he said when asked about him contesting the forthcoming assembly elections. This is not first time that a famous artiste of the state has joined politics. In 2009, Sufi singer Hans Raj Hans contested the Jalandhar parliamentary seat on a SAD ticket, but lost. About 15 years earlier, Kuldeep Manak, who used to sing a genre of traditional Punjabi songs called Kaliyan, contested the Lok Sabha from Bathinda as an Independent and lost. Bhagwant is a first stand-up comic to join active politics. 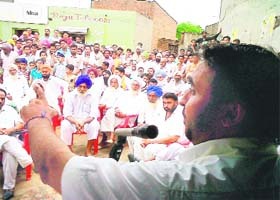 A few days back, Bhagwant Mann was in Dona Nanka, Teja Rawela, Matam Nagar and Bhanewala villages of the Fazilka belt where many children had suffered a loss of vision and hearing, greying of hair, skin diseases, physical deformities and mental retardation due to consumption of the heavily contaminated water. Bhagwant Mann led a protest in Faridkot to register his anguish at the high uranium content in water in the area last year. Hailed as “mini parliament” of the Sikhs, the Shiromani Gurdwara Parbandhak Committee (SGPC) has underwent several political upheavals while continuing as a powerful instrument in Punjab politics in general and the Sikh politics in particular. Though mandated to be a religious body to manage affairs of Sikh historic shrines, it has been, since its inception in 1926, the epicentre of heightened political activity every time it goes to its electoral college, at times controversial. Initially, it was every three years and now it is five years, but the elections to the general house are being held after seven years this time. The Shiromani Akali Dal, which was launched as political arm of the SGPC, has generally been in control of this august body except for a brief period post-Partition. 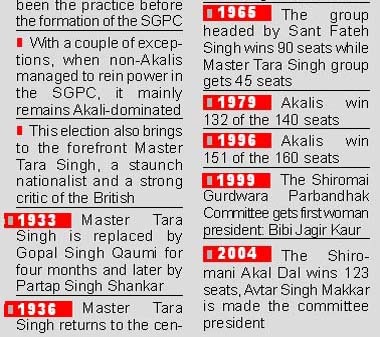 Born out of a reform movement in 1920, the SGPC got the legislative cover six years later. The then British rulers had to bow to the majority voice as their attempt to divide the Sikhs failed. The Act came as a sequel to a demand by the Sikhs. And, only Sikhs vote in accordance with an Act, initially of the undivided Punjab and now a Central Act after reorganisation of Punjab in 1966. No other religious body in the country has such elections or a body administered by an Act of the state. Some Sikh scholars are even now opposed to the concept of holding elections under an Act of the state. They argue that even the resolutions passed by the SGPC are not enough to get any clause or Section of the Gurdwara Act amended. It is the political discretion of the government at the Centre whether to accept or reject the resolution. If Mian Mir, a Muslim, laid the foundation of Sri Harmandar Sahib (Golden Temple), it was Bhai Mehtab Singh, son of Maulvi Karim Baksh (he became become Bhai Lakhbir Singh on June 14, 1903, after baptisation), who was among the flag-bearers of the reform initiative that paved way for the formation of the SGPC. Bhai Mehtab Singh was the head of Khalsa Biradri that had convened a special convention of the Sikhs, especially backward classes, at the historic Jallianwala Bagh from October 10 to 12. The agenda of the convention was to get Sikhs from backward classes accepted at par with other Sikhs at all historic gurdwaras, including Harmandar Sahib. Going by Sikh historians, no eminent Sikh leader turned up on the first day of the convention that was joined by a large number of students of Khalsa College. On the second day, however, several leaders, including Sundar Singh Majithia, Kartar Singh Jhabbar, Teja Singh Bhuchar, Mangal Singh Mann and Bahadur Singh Hakim, turned up. Subsequently, a resolution was adopted that next morning Sikhs from backward classes should go to the Golden Temple with “Prasad”. 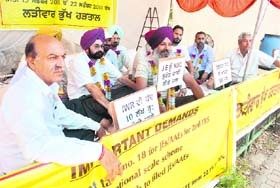 Several Sikh leaders agreed to accompany them. As resolved, next morning after the congregation, a procession of Sikhs from backward classes went to Harmandar Sahib where the priests, as expected, refused to accept “Prasad” from them. On behalf of the processionists, Professor Harkishen Singh Bajwa requested the priests thrice to accept the “Prasad” but they refused. When two other prominent leaders of that time, Kartar Singh Jhabbar and Teja Singh Bhuchar, reached Sri Harmandar Sahib, it was decided to take “hukamnama” from Sri Guru Granth Sahib. Priests were left with no choice but to perform “ardas” and accept the “Prasad”. As the processionists then moved to Sri Akal Takht, priests disappeared from there. Processionists took over the control of Sri Akal Takht, performed ardas and named a 17-member team to look after Sri Akal Takht. Teja Singh Bhuchar was named “Jathedar” of Akal Takht. This is how the term “Jathedar” got official recognition in Sikh politics. Taken by surprise by these developments, Amritsar Deputy Commissioner convened a meeting of Sikh leaders, priests and those controlling Sikh historic shrines. A seven-member committee was constituted to look after Sri Harmandar Sahib. On a suggestion from Master Mota Singh, it was decided to convene a “Sarbat Khalsa” so as to elect an interim committee to look after the historic Sikh gurdwaras. Subsequently, a hukamnama was issued by Dr Gurbaksh Singh convening “Sarbat Khalsa” on November 15, 1920, to decide about management of historic Sikh gurdwaras. It was clarified that those who want to attend the Sarbat Khalsa should be amritdharis (baptised), recite five Banis (nitnem), keep five Kakkars, and should be early risers and also regular contributors of one-tenth income for charity. The Governor, in an attempt to scuttle the Sarbat Khalsa, named a 36-member committee to run the affairs of Sikh historic shrines. Harbans Singh Attari was named president of the committee. 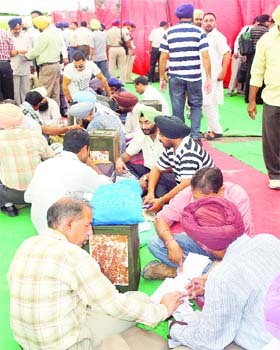 However, the Sarbat Khalsa was held as scheduled. One hundred fifty members were elected, including some of those named in the Governor’s list as well. In order to avoid any confrontation, even those from the official list who could not be elected were included in the new committee, thus, its strength reached 175. Next day meeting of this 175-member committee was held to elect office-bearers. Sundar Singh Majithia was elected president. Later, he was nominated to the Punjab Executive Council and Harbans Singh Attari replaced him. 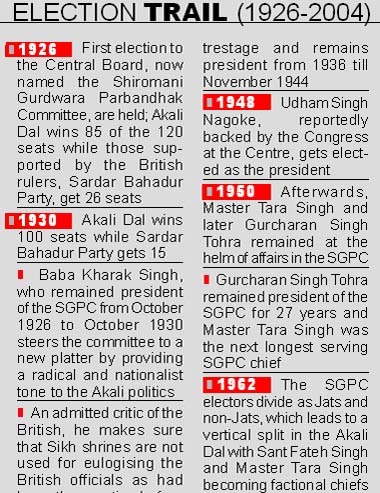 On April 30, 1921, the SGPC was registered as a society. At the next general house meeting held on August 14, 1921, Baba Kharak Singh was chosen as president. Since Sikhs had started peaceful agitations to get historic gurdwaras under the control of the committee, a conflict ensued that saw more than 500 Sikhs getting killed in police firing at different places. Thousands of Sikhs were arrested. Mounting pressure from the Sikhs made the British relent and it agreed to promulgate the Gurdwara Act provided those in jails should agree to it. It again divided the Sikhs. Some agreed while others refused and stayed in jails. It was on June 18, 1926 that elections to the Central Board, later named the Shiromani Gurdwara Parbandhak Committee, were held. Amarinder said despite this the Akalis could not achieve political majority of their own and had to align with the BJP in its different avatars at different times. He said Badal’s unsolicited presence at Modi’s fast was purely aimed at the next assembly elections in the state. The Congress leader said Chief Minister should, however, tell the people whether he had sorted out the Anand Karaj (Marriage) Act issue with the BJP, as it stands for uniform civil code or the federal structure, the status of minorities and other contentious issues. “I am sure Mr Badal also knows and understands it, too, well, but is blind towards these issues, in desperate pursuit of clinging to power in the state,” he remarked. Badal appreciated Gujarat CM Narendra Modi for his pro-development vision and dynamic outlook. He commended him on achieving a growth rate of 11% in Gujarat against average national growth rate of 7 to 8 per cent and described him as a light house of development. He called upon the CMs of other states to replicate the Gujarat model of development to ensure overall prosperity and progress in their respective states. According to the information available, more than 50 ft of the bundh has been eroded. Another five feet of erosion may cause a breach and inundate dozens of villages, fear residents. “We are moving to safer places as we expect that the bundh may be breached in the few hours,” Preetam Singh of Sandha village near the Satluj. He cursed drainage officials and lamented that the government had not paid heed to the bundh-strengthening work and officials now were running from pillar to post to control the situation. Hundreds of villagers, along with labourers of the Drainage Department, were engaged in cutting trees and putting these alongside the bundh to stop it from eroding. Villagers and officials of the Drainage Department engaged in a verbal duel with the residents flaying the officers on their failure to control the situation. XEN Drainage RL Sandhu said that though the situation had turned worse, they would do their best to control the breach. “As many as 65 labourers of the department, along with hundreds of villagers, are engaged in bundh-strengthening work,” Sandhu said. Interestingly, bundh-strengthening work at the Dhusi bundh at Baopur village was already being carried out for the past month and more than Rs 35 lakh had been spent by the Drainage Department in laying down studs and spurs. SDO Drainage Harish Kumar said the entire amount, in lakhs, now gone down the drain as a number of studs and spurs, laid down recently, got submerged into the waters. “We have sought a fresh fund of Rs 25 lakh for bundh-strengthening work" the SDO said. SDM Shahkot TN Passi said that Deputy Commissioner, Jalandhar, had assured them all possible help. A 1997-batch IAS officer, Srivastava was posted as Secretary, Punjab Lok Pal, at the time of filing of the application. Taking up his plea filed through counsel Umesh Narang, the Bench of judicial member Justice SD Anand and administrative member Khushiram also directed the expunging of adverse remarks recorded by the reviewing authority in his annual confidential report for 2003-04. The Bench also refused to take into consideration the allegations of malafides levelled against the Chief Secretary. The Bench asserted, “Though the applicant has alleged malafides against the Chief Secretary, the allegations of malafides have not been substantiated, nor the applicant has arrayed him as a party by name. Therefore, the allegations of malafides cannot be sustained”. Srivastava, in his plea, had earlier contended that the reporting officer on August 18, 2004, had assessed him as very good in the ACR for 2003-04. The reviewing authority was required to evaluate it by September 30, 2004, but kept sitting on the matter. Finally, he recorded his remarks on January 17, 2006 - just three days prior to his retirement. The remarks read: “An officer of average capabilities, who did not leave too good an impression either by way of work or reputation”. The IAS officer added that due to the adverse remarks in the ACR for 2003-04, he was not found suitable for promotion by the departmental promotion committee (DPC) and his claim was rejected on January 29 last. In its detailed order, the Bench added: "It is trite law that when the recording, reviewing, accepting authority gives adverse remarks to an employee, the authority concerned is required to record its reasons for poor performance. State Education Secretary Hussan Lal has recommended the immediate suspension of DEO Secondary Shindo Sahni and directed that she be posted out of Gurdaspur. The Education Minister had posted the officer at Gurdaspur despite the objection of a former Education Secretary who had advised that she should not be posted as a DEO as she had three serious complaints pending against her. The Education Secretary has recommended Shindo’s suspension following an inquiry into the allegations against the DEO by a senior official of the department. According to sources, the DEO had directed school management development committees to purchase furniture from two companies recommended by her. The managements were supplied quotations by Shindo who also asked them to give cheques of the full amount to her. These cheques were handed over to the two companies. The Education Secretary said a preliminary inquiry had revealed that both companies, which had been given orders to supply the furniture, were not registered with the Excise Department. He said the inquiry had also revealed that some schools had not received the furniture so far despite the fact that the orders had been placed in April. Sources said under a NABARD scheme, 351 schools had been permitted to purchase modern furniture in the state. Out of these, a sizable number of schools were chosen from Gurdaspur district. Each school was permitted to purchase furniture in the range of Rs 1-1.5 lakh. Meanwhile, the DEO said she had not done anything wrong and did not know that any complaint had been made in the case. She also claimed that she did not have any knowledge of any inquiry being conducted against her. In Patiala district, more than 50 per cent seats of male workers are vacant in various primary health centres, due to which the Health Department is unable to take proper measures for the control of these diseases. The staff shortage has always been a primary concern with this department, but during this crucial time when the chances of spreading of various diseases are high, the situation becomes more miserable. 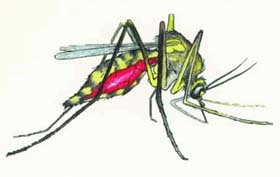 “Despite the fact that spread of malaria is common during monsoons, no one is actually concerned about taking preventive measures. Most of the health workers, including doctors, who have been deputed to make slides, are unaware of how to make them. The condition in the department is so bad that the kits for testing Plasmodium Falciparum (a protozoan parasite that cause malaria in humans) have reached a few days back after the death of four malaria patients in Chailaila village,” he added. “If the government cannot make appointments, they should employ youths from villages on contractual basis to check the outbreak of these diseases,” rued another health worker. State President of the PCMS Association Dr Hardeep Singh has stated that 60 per cent share in the PG (MD/MS) courses was only for the PCMS doctors, serving in difficult rural areas. “The PCMS Association will oppose any move attempting to reduce the number of seats meant for the PCMS doctors. This benefit has been provided to the PCMS doctors not only to strengthen the rural healthcare, but also to provide specialist service in clinical civil hospitals of Punjab,” he added. Dr Hardeep further asserted that the PCMS doctors, working in the Department of Health and Family Welfare, were rendering medical services to the poor population of the state. “Only the PCMS doctors are running 24-hour emergency services and medico-legal work for the poor. Any sort of cut in the seats for the PG (MD/MS) courses will discourage the PCMS doctors for taking up the rural service. 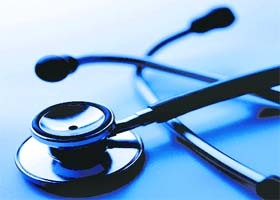 The claim of giving some quota for the PG courses by the doctors of other departments is not justified,” he said. Meanwhile, state advisor of the Rural Medical Services Association (RMSA), Punjab, Dr JP Narula has claimed that PG quota was meant to promote the rural jobs, as qualified MBBS doctors do not prefer to serve in the rural areas. “It was already decided by the Punjab Cabinet that all the benefits being given to PCMS doctors will be extended to the RMOs, whose services were regularised in March this year. We will fight for getting the quota in the PG courses as we are serving the rural population for more than past five years,” he said. Born in a family where her father had to work day and night to provide basic facilities, Amandeep had always dreamt of doing something different in the field of education. Being the only sister of two brothers, Devinder Singh and Kuljinder Singh, Amandeep was always a pampered child. Talking to The Tribune, she said “I used to enjoy mathematics ever since I was young but when I scored 100 per cent marks in Class X examination, I decided to take up mathematics as my career. After doing my postgraduation in mathematics, I started teaching at Chandigarh Engineering College, Landran, and also started doing my PhD from Punjabi University, Patiala ,” she added. Notably, the main exams, which started from September 14, are being conducted under strict vigil at the Guru Nanak Foundation School here. Besides CCTV cameras, mobile jammers have been installed at the exam centre to scuttle attempt by anybody to use mobile phones or other gadgets during the exam. “The question paper is set just an hour prior to the start of the examination and everything at the exam centre is being monitored through CCTV cameras. Even the PPSC functionaries, who are in the office, where the question paper is being set, are not allowed to leave the office, till the question paper is distributed among the candidates,” said one of the commission members. Though the mobile phones are taken from the candidates, still in order to ensure foolproof conduct of the examination, mobile jammers have also been installed. Even the candidates, who need calculators, are being provided the same by the commission. The commission is learnt to have purchased 170 calculators for the purpose. As per information, on the first day of the exam on September 14, out of 823 candidates, who were to appear in the Sociology Paper-A, about 85 candidates were absent. “The figure of the absentee candidates for the main exam is quite high, which implies that candidates who were making futile attempts to sabotage the free-and-fair process, have got a message that there is no possibility of any foul play,” said sources in the PPSC. The court today heard the arguments advanced by the defence lawyer,m representing Ashok Chopra, relating to Today Homes Company. He concluded his arguments today. Captain Amarinder Singh did not appear before the court. His lawyer Trilok Singh Sood apprised the court that he was suffering from backache and unable to attend the court for today. He requested the court for exemption, which was accepted by the court. Raninder Singh, Harpreet Sandhu (ex-additional advocate general), Raminder Richi were present during the court hearing. In the first case, the Bakhshiwal police has arrested Narinder Singh and Mahavir Prasad and recovered 25 bottles of the Indian made Foreign Liquor (IMFL) from them. In another case, Jagjit Singh, the police arrested Makhan Singh and Sukhwinder Singh and 22 bottles of IMFL were recovered from their car. Meanwhile, the Nabha police has registered a case against Umesh Sharma, who was arrested for selling liquor at his liquor vend in the Berha Gate area in Nabha.